What if LAXPD Had the Resources to Do Better? Back in May, we applauded the Los Angeles Board of Airport Commissioners’ decision to approve the building of a state-of-the art police facility that would consolidate all LAXPD operations in one 12-acre site. This major step forward in public safety at LAX shows the willingness of Los Angeles World Airports (LAWA) to modernize the LAXPD to match the security needs of our massively expanding airport. While exciting, we must not forget that this readiness to invest in LAXPD didn’t happen overnight. When management first announced plans for the airport’s extensive facelift in 2016, no funds were set aside to improve policing resources and facilities. It took a lot of advocating from LAAPOA and public safety stakeholders to get management to invest in policing and to get this much-needed building project off the ground. As we await the new facility’s projected completion in 2021, it’s tempting to think about other ways in which our Department could improve if given the proper energy, effort and funding. What if LAXPD had the resources to do better? What if the Department didn’t have to convince management of the need to improve leadership, recruitment and equipment? Let’s envision what that would look like. What if LAXPD Management Promoted From Within? Historically, LAWA has passed up LAXPD personnel in favor of officers from outside agencies to fill the Department’s top three law enforcement positions. 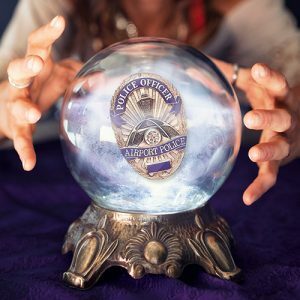 The positions of assistant airport police chief, chief of airport police and deputy director of aviation security services have been filled 19 times in the past decade or so, and only once was an LAXPD candidate chosen for one of those positions. That’s 18 missed opportunities for qualified LAXPD candidates, who have dedicated their time to learning the ins and outs of our airport’s security, to take the helm and use their institutional knowledge to further advance the Department. If management instead promoted from within, LAXPD might function more cohesively and with less of the disconnect posed by those entering from smaller, less sophisticated outside agencies. LAXPD officers are required to meet the California Commission on Peace Officer Standards and Training (POST) requirements in addition to taking state-mandated aviation-specific training (e.g., terrorist attacks and hijackings). After their training, they are put to the test each day, protecting both travelers and airport facilities from inside and outside threats and working with multiple federal agencies to enforce local, state and federal laws. Over time, officers become highly trained and educated in all aspects of airport policing functions. Those who promote to captain supervise forces of over 500 sworn officers and must use their sound judgment to ensure the safety of the airport. Naturally, it would make sense for officers who have risen through the ranks to oversee Department operations from senior-level positions. Unlike outsiders, they need no introduction to the Department, no period of acclimation and no resources to brush up on the highly specialized work of airport police. The transition would be seamless, and these leaders would go on to improve airport safety and security with the specialized knowledge they have accrued throughout their careers. Promoting from within would also strengthen morale. Officers would not only feel a sense of pride seeing one of their own leading the force, but also see an opportunity for themselves to advance and promote. What if LAXPD Management Invested in Recruitment? With recruitment rates in law enforcement at all-time lows, agencies across the nation are understaffed and overworked. In recent years, LAXPD has felt the unfortunate effects of decreased staffing levels, which have inadvertently jeopardized airport safety. Now more than ever, it’s imperative that management increase funding for recruitment programs to ensure that our airport is properly staffed and secured. One solution to staffing woes would be to aim recruitment at millennials, the next generation of law enforcement. As we have covered, millennials have a unique set of needs. In addition to attractive pay and benefits, they want quicker hiring processes, personal and professional development opportunities, job security and a sense of purpose. If management updated recruitment, hiring and department processes, and made the institutional changes necessary to address these needs, the job of airport police officer would likely attract more prospective applicants. An investment in recruiting and retention efforts ultimately demonstrates to candidates that the Department will take care of them throughout their career. This investment also positively affects the future of the profession, as the younger officers are more likely to stay in law enforcement, improve the profession over time and change the status quo. We can ill afford to go backward to the days of previous General Manager Gina Marie Lindsey, who viewed public safety as an afterthought and LAWA employees as “the help.” New CAO Deborah Flint has committed to improving the quality of life for all LAWA employees, as well as for travelers. She wants to bring the gold standard to aviation travel, and we want to ensure that LAXPD is included in that modernization so it can be the model for other law enforcement agencies around the world to aspire to. Growing the ranks by attracting and retaining fresh, motivated and qualified candidates with long careers ahead of them demonstrates a firm belief in the bright future of LAXPD and ensures its continued success as it progresses to meet 21st-century public safety needs. What if LAXPD Management Budgeted for Police Cars? The replacement of nonfunctioning police cars has been slow going. While we have had some fleet additions in the past year or so, for years, we have raised concerns about the condition of our vehicles. Many of them have well over 100,000 miles on them, broken seat belts and more. Officers use these around the clock, handing off the same vehicles from morning to day to night shifts. Their constant use has limited their lifespans and functionality, making them unsafe for our officers. If management finished replacing our weary fleet with modern vehicles, our officers would be able to patrol our airports safely, without having to worry about whether their vehicles will see them through their shifts. If management also added more vehicles to our fleet, officers would be able to rotate a vehicle’s usage, distributing mileage among shifts. Plus, officers wouldn’t need to wait for a car to be returned from an overlapping shift before they can start their shift.